1.1 What is the Fark Email Notification service? 1.2 What is the Fark NotNewsletter? 1.3 What is a Fark Preferred Partner? What is the Fark Email Notification service? 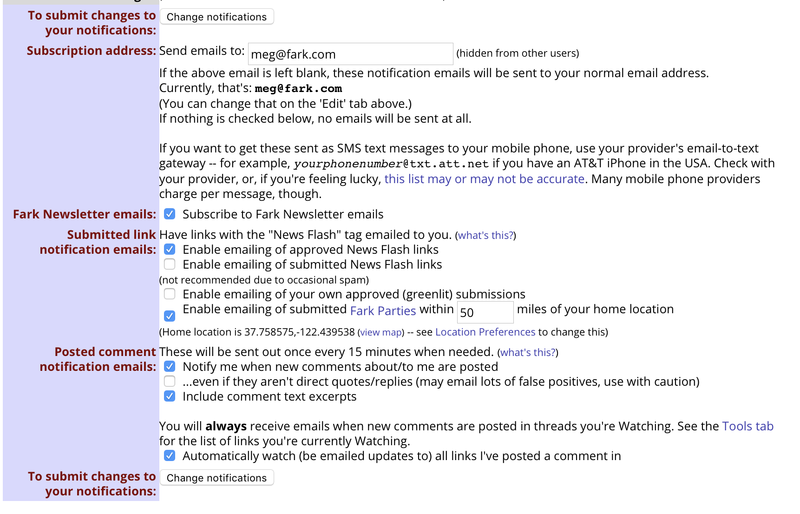 Fark Email Notifications keep you apprised of new developments on Fark, whether they be News Flashes, Fark Parties, greenlights, replies to your posts, or new threads in comments that you're interested in. To enable or disable these email notifications, go to the Notifications pane of your MyFark profile. On this page, you can specify an email address where you'd like us to send the notifications (by default the email linked your your account), and what type of notifications you'd like to receive. Be sure that your spam filters allow email notifications from Fark, and that your email address in your profile is up to date. For Fark Party notifications to work, the party host must submit this party using the Fark Party submission form (https://www.fark.com/party). Watching a thread is different than Favoriting a thread. When you Favorite a thread, you want to keep a link to it in your profile for all time; when you Watch a thread, you're interested in new comments in that thread until the thread is closed to new comments. You can both Favorite and Watch a thread. Watched links will automatically remove themselves a few days after a link is closed; Favorite links are permanent. Watched links will always send emails notifying you of new comments. What is the Fark NotNewsletter? We send out a weekly newsletter filled with Fark announcements, the best Fark comments and headlines, upcoming Fark parties, and a whole lot more. If you sign up for a Fark account, you're automatically subscribed to the newsletter (though you can easily unsubscribe in your myFark prefs (see screenshot above) or by clicking the 'Unsubscribe' link at the bottom of the newsletter. Signing up for an account gets you the Fark NotNewsletter AND a bunch of other stuff - like the ability to change your viewing preferences, comment on links, submit links of your own, and vote on comments. Click Here to sign up for an account, and be automatically subscribed to the newsletter. If you'd rather not sign up for a Fark account, but still want to receive the newsletter, you can enter your email address in the "Sign up for the Fark NotNewsletter" box on the right side of any Fark page. What is a Fark Preferred Partner? A Fark Preferred Partner has first dibs on traffic for identical (or at least nearly identical) articles out there on the web. It doesn't change the way we choose links for the main/category pages. After links are greenlit for the main/category pages, we look to see if one of our Preferred Partner sites has the same story (AP/Reuters, write-ups on press releases, etc). If so, we switch the link to the Partner site. It's great for our Preferred Partners (they get more traffic), great for Fark (we get more revenue), and great for our users (we keep the same great quality of content). If you're interested in becoming a Fark Preferred Partner, please contact Drew via our feedback form.